If you’ve ever had to sell your home, you probably know all the little tricks to close the sale: make a batch of chocolate chip cookies a few hours before the buyers come so the aroma will fill the house; clean the house thoroughly; move personal possessions out of sight. If you can afford it, staging is an excellent idea. The first and most important impression is to get a potential buyer to stop by is curb appeal. You want prospective buyers to picture themselves in your home. The same applies to your city or town. Even if visitors are just passing through, you want the gateway to your city to pleasantly greet them. More and more cities have been creating gateway beautification projects at points of entry to welcome visitors — think tourist dollars — and leave them feeling as though they’re coming home. A town can extend its spirit of homecoming to guests through meticulous landscaping and gardening at the gateway entrance; doing away with blighted gateway areas; adding new parks; and utilizing environmentally friendly rain gardens. Redeveloping the shuttered gas stations into contemporary businesses; changing some open spaces into things of beauty; and adding attractive gateway corridor signage or street murals are also desirable. Employing landscape architects can pay off handsomely in giving your city an identity of its own, especially if you have a well-known attraction or history. Shout it out with large colorful posters, ribbons, banners or flags, a distinctive logo or an abstract artistic expression. Plant similar trees on either side of the corridor so they arch as vehicles pass underneath. Winnemucca, Nev., population 7,396, is one city that undertook such an endeavor to entice travelers entering the city from off-ramps, said Mayor Di An Putnam, of the project that took place four years ago. “Our gateway project consisted of a joint project with Humboldt County, Winnemucca Convention and Visitors Association and the city of Winnemucca,” said Putnam, adding that the development cost approximately $500,000. According to Dave Gamstetter, superintendent of operations in Cincinnati, Ohio, his department has done multiple gateway projects so he has chosen one that seems to have a lasting impact to share with The Municipal’s readers. 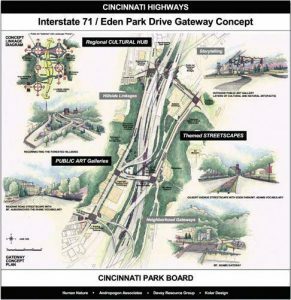 “This particular interchange is the gateway into downtown off I-71 at Eden Park Drive to Elsinore where I-71 enters the city. It was a very ugly city entrance and also a main entryway. Additionally, it is in the middle of the cultural hub in the city. “We started with a plan, which we implemented over a two-to-three-year period. This included the interchange of Reading Road at Eden Park Drive with I-71 overhead; this particular area was partially maintained under the state’s Adopt-a-Highway program. Mill Valley Corporation, which picked up litter there a few times weekly, has since moved on, so we do it all now. Park staff maintains the turf, plant and flowerbeds,” he said. New development was built after the intersection was beautified between the beginning of the project and 2012, according to Gamstetter, who added that the county real estate valuation showed a great increase in the property valuation which occurred after the interchange was beautified. 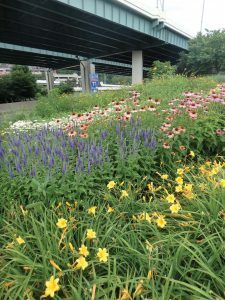 “ODOT was a partner along with our local Keep America Beautiful affiliate KCB (Keep Cincinnati Beautiful) and took place approximately 2000-2002,” said Gamstetter. “The project was done by our Cincinnati Park Board and took a little over two years. The cost was around $150,000 plus a lot of volunteer and in-kind resources. 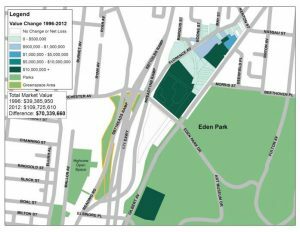 An analysis was completed examining the property value changes to greenspaces in the Eden Park Drive corridor from 1996-2012. Some of the spaces saw a significant increase of $10,000,000-plus while others had more moderate changes in value. Overall, in 1996, the total market value was $39,385,950; this saw an increase to $109,725,610 in 2012, a difference of $70,339,660. The beautification played a role in that increased value since no other infrastructure investments were made. 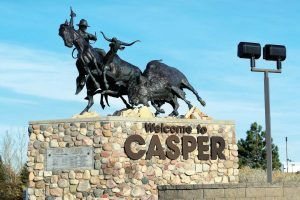 According to Gilda Lara, executive director of Casper, Wy., her city has three large gateway beautification projects that have been completed through the efforts of their beautification committee dating back to 2001. “The Casper Area Chamber of Commerce actively participates in city beautification efforts, including the landmark gateway sculptures that sit at the entrances to our great city thus creating the beautification committee,” said Lara, noting these sculptures are reminiscent of famed Western artist Frederic Remington. In addition, the Casper Area Chamber of Commerce and the beautification committee have collaborated with several local and statewide agencies on projects such as the cleanup and remediation of the Amoco/BP refinery and the Platte River Trails while also planting trees and providing green spaces throughout the city. “The structure of the chamber’s beautification committee is to be comprised of individuals employed by chamber member organizations in any industry for the sole purpose of actively participating in city beautification efforts, including the landmark gateway sculptures that sit at the entrances to our great city,” concluded Lara.